On January 3, 2015, the new FRC game was announced, ushering thousands of students into a new, hectic, six-week build season. The game, Recycle Rush, is played on a 27 ft. by 54 ft. field by two alliances of three teams each who aim to score as many points as possible in a 2 ½ minute match. 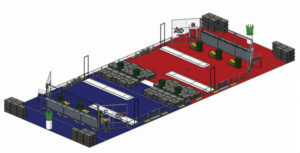 The field is divided into the Red Alliance and Blue Alliance’s respective sides by the neutral Step running across the center. Each side has 3 sections: 1.) the Staging Zone, 2.) the Auto Zone, and 3.) the Landfill. Each Auto Zone is roughly framed in by two Scoring Platforms, each 15 ft. 7 in. long, 1 ft. 8 in. wide, and 2 in. tall. The central Step is surrounded by and covered with 68 Gray Totes and 4 Recycling Containers. Platforms and topping them with Recycling Containers. Additional points are earned by putting “Litter”, 4 ½ ft. long pool noodles, into the holes in the tops of the containers. To encourage Coopertition® between alliances, the game also offers a way for teams to score points for both sides by working together to stack 4 yellow totes on the Step. This year Mechanical Mayhem is registered to participate in 3 district tournaments: 1.) Granite State District Event at Nashua South High School from February 26-28, 2.) UMass District Event in North Dartmouth from March 12-14, and 3.) Northeastern District Event in Boston from March 26-28.